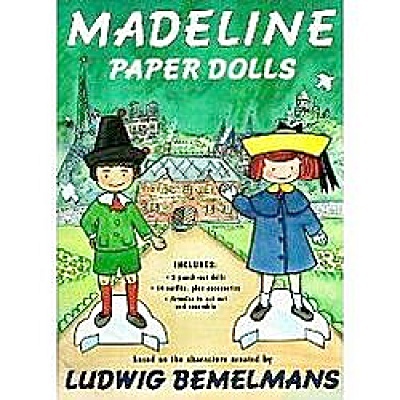 Madeline Paper Dolls booklet by Viking, in 1994. These paper dolls are based upon the characters created by Ludwig Bemelmans, and the art is by Jody Wheeler. The heavy cardboard booklet includes 9 inch punch out paper dolls of the red headed girl, Madeline; and the brunette boy, Pepito, the son of the Spanish Ambassador next door. The paper doll set includes a total of 14 outfits with accessories to cut out for the two dolls, and a heavier armoire to cut out and assemble for storing their clothing. Madeline's outfits include the blue coat, yellow hat, and yellow dress that she is best known to wear and more. Four of the outfits in the set go to Pepito for adventures with Madeline, including his green suit and a tall hat shown on the cover and more. New, uncut, and mint condition.